One of the most moving architectural experiences in Buffalo is to watch a snowstorm sweep across Delaware Park from the warmth of the Albright-Knox Art Gallery's glass-walled auditorium. With a new installation called "Common Sky," the Danish-Icelandic artist Ólafur Eliasson has created an even closer and more visceral connection with nature underneath a sky of clear and mirrored glass. Eliasson, whose sculptural fusions of artwork and architecture often deal with the presence or absence of light, characterized the piece as an attempt to bring what he called "ephemera" — or the intangible environment — to life for visitors. He is known for major installations, such as a series of monumental waterfalls in New York Harbor and a project in which he dyed large sections of rivers green with environmentally safe dye in Norway, Los Angeles, Stockholm and Tokyo. The monumental sculpture, announced on Thursday as the gallery detailed plans for its long-simmering expansion project, will rise from the empty space that currently exists above the museum's current courtyard. With a geometric network of interlocking glass panels — some of which will allow light through, others of which will reflect what's below — the installation concentrates itself into a funnel that connects to the courtyard's floor. In that way, visitors will be able to see not only their own reflections, but the Buffalo sky and whatever precipitation, fog, gloom or sunshine it happens to contain. "It’s covered in a way that celebrates the weather, the light, the colors, the seasons, what we could also call the ephemera," Eliasson said during a visit to the Albright-Knox on Thursday. "The ephemera meaning: the way the light changes through the year, the way the light changes through the day, the way the winter comes here in Buffalo with this quite significant amount of snow. "I think that one of the great challenges the younger generation is facing is how to actually connect the dots between cultural substance and quality, identity and the fact that the future is going to host relevant questions about climate about how we articulate the physical relationship with the weather: the snow, the spring and the changing seasons." 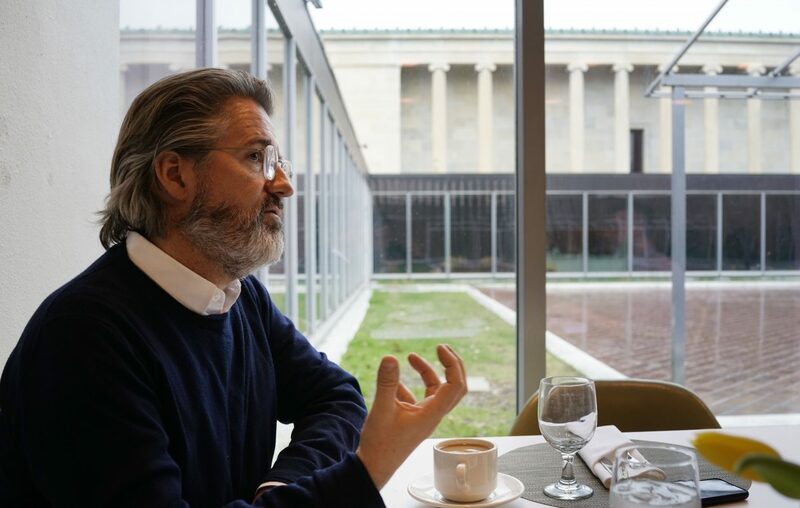 Eliasson's work on the project with the Albright-Knox and architects from OMA, he said, gave him an appreciation for the "civic muscle" of Western New York. "If you take the whole of the Western New York area and you count the amount of museums, theaters, dance, music, literature, poetry, you take all of that … you actually have a significant civic muscle," he said. "This is, I think, sometimes not really fully articulated because it is decentralized, it is not quantifiable. What I have experienced from having worked on this project is that this consciousness is there."